I swear, I think I'm getting dumber by the day. 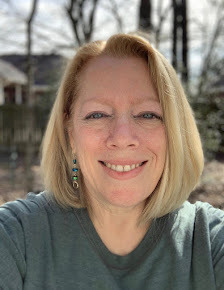 And naturally, this story involves another day volunteering at the gift shop, so I don't know if those two things go hand-in-hand, or it's just that I don't get out much. Probably the latter, but time will tell, I suppose. Scene: gift shop. I was on the customer side of the counter while Rosalie was behind it. We were chatting with a customer who was a hospital employee, when a man came in, went right to the card rack and then the flower case and came to the counter with a pretty arrangement along with a baby card for a girl. I said, as I do whenever anyone is obviously buying something for a just-born baby, "congratulations" and he quickly shot back "it's not mine" - well OK, then. I mean, most of the time the baby's other parent isn't the one buying the flowers, but whatever, dude. Rosalie rang up his purchases while he borrowed a pen and wrote a message in the card. I was standing to his right, just a couple of feet away, when I realized that he had a gun on his belt. Now, Texas has had been an open carry state since January of this year, but I have only seen civilians displaying their weapons less than a handful of times (most noticeably my next-door neighbor, rolleyes). So I stood there and looked at his set up - granted, I haven't really taken an up close and personal look at a holstered gun like that, but it seemed pretty locked up to me, which was a good thing. Nothing like the old toy pistol and holster sets that my kids had when they were little - it didn't look like you could just randomly grab the gun out of the holster without flipping some levers and such. Anyway, the guy wasn't all that friendly. He wasn't mean, but he just didn't engage in the normal chitchat that we usually see at the gift shop. Rosalie gave him his change, he put the card into the envelope, grabbed the flowers, and walked out of the shop. It was a few seconds later that my brain kicked in and I asked Rosalie and the other customer if guns were allowed on hospital grounds. BIG EYES from them - the employee customer was on the other side of him so there's no way she could have seen it, and Rosalie didn't notice it as she was focusing on the sale. Well crap. I headed out and didn't see him; he'd already turned the corner to the elevators. I quickly walked to the nearby concierge desk, which is located right by the elevators, and asked them if they'd seen the man with a gun walk by. They had, and luckily, they'd not only noticed the gun but also that his polo shirt was embroidered with a local law enforcement badge. So because he was a member of law enforcement, it was actually OK that he was carrying the gun; that said, regular civilians aren't allowed to bring their weapons inside of the hospital. I mean, I thought that was the case, but then when you see someone brazenly displaying their gun, you start to question yourself. Or at least I do - again, I'm feeling pretty dumb about this. I should clarify that I said "brazenly displaying" because this man was wearing jeans and a polo shirt - at a quick glance, nothing about him said law enforcement. I wouldn't have thought twice had a uniformed officer come into the gift shop with his weapon on display, but the gun looked out of place on the plainclothes lawman. I blocked out the business card of the company doing this giveaway - don't want to give them any free advertising here. 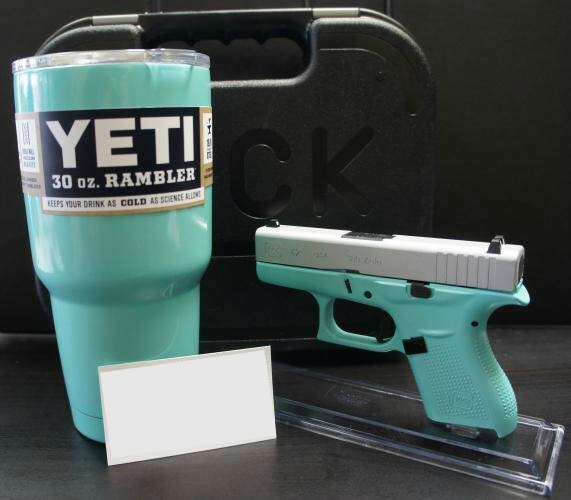 Why, who wouldn't want to match their gun to their Yeti cup? Accessorizing at its finest - get a color to go with each outfit! In case you couldn't tell, that was sarcasm...I don't think guns should be pretty colors and coordinate with anything - this makes them seem less foreboding, which is wrong, wrong, WRONG. This pretty aqua-colored gun can kill a person. But I see things like this and after my initial appalled reaction, I guess I start to become inured to the fact that weapons are all around me, and maybe that's why I didn't react the way I really should have when I first saw that man with a gun on his belt in the hospital gift shop. Still, it doesn't explain why it bothered me so much to see my neighbor at my doorstep, with his gun on his belt, when apparently all I thought to do was observe how the gun was holstered with the man at the hospital. The clinic where I work borders Chicago and I see a lot of police officers' kids. But it never fails to startle me when I see the gun on their belt. I don't know--it bothers me for some reason. It probably feels extreme, in a health-care setting, to see a weapon like that. Guns bother me even on officers. And I grew up around guns and actually had my own rifle (never really hunted, though). We do not have open carry here and it would freak me out if I saw a gun on someone. Could be that you were zeroed in on the gun and not looking at his shirt. And the other thing, the whole guns as accessories or "cool" things to have. No. Just no. Weapons to be treated with respect only. Guns are not accessories. Period. I am not a fan of guns or the open carry laws. And I grew up with a father who hunted and now have a brother who is very much into guns and bows and arrows. No thank you! Don't feel dumb because you're not. At least now you know the rules and if someone else comes in with a gun and you don't see a badge you can just call security. You sound like a reasonable, responsible gun owner. I'm sorry to say that I don't see or hear a lot of people like you around here...and that's a shame. Carrying a gun by citizens is forbidden here. Now that you mention it, I don't even know if all police officers wear guns, I think it depends on their function. But I don't see police officers that often. Next time I will check it out. I don't have a problem that law officers wear guns though. You'll have to report back after you do your police officer recon - now I'm curious! Don't feel dumb! You are still getting used to open carry, and likely never will, so it makes sense that sometimes your brain is like "alert! alert!" and sometimes it's not, because you've recently been fed info (on FB) about guns and it's becoming more normal to see them. If I expect someone to have one, I am not shocked by it (law enforcement, people I know have them). But we saw someone with one once at a gas station and were like... um, what? Geez, a gun at a gas station kinda screams ROBBERY to me...I'd beat feet out of there before getting caught in the middle of something awful! But I don't think you're dumb. Its not just Facebook. We are surrounded by images of guns on TV shows and movies. I think you're right - images of guns are everywhere, unfortunately.